Hello Everyone, welcome to Day 2 Wplus9 February 2015 Release Previews. 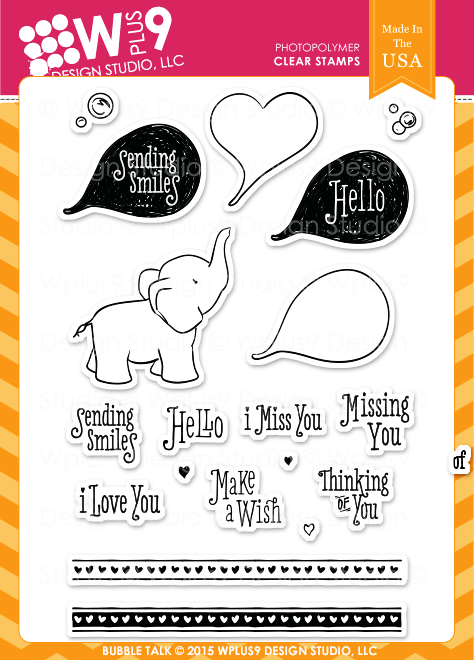 I hope you enjoyed the Day 1 previews (HERE) so far, but today I am showcasing another ellie set called Bubble Talk stamp set. This set also have a matching coordinating dies. 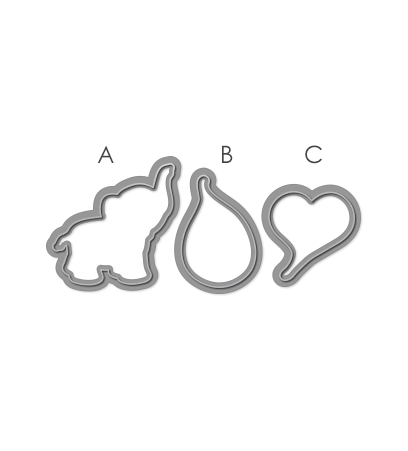 Folk Art Alphabet die set. To begin, I die-cut my letters 3 times to make them sturdy using the Folk Art Alphabet die set , then put it a side. 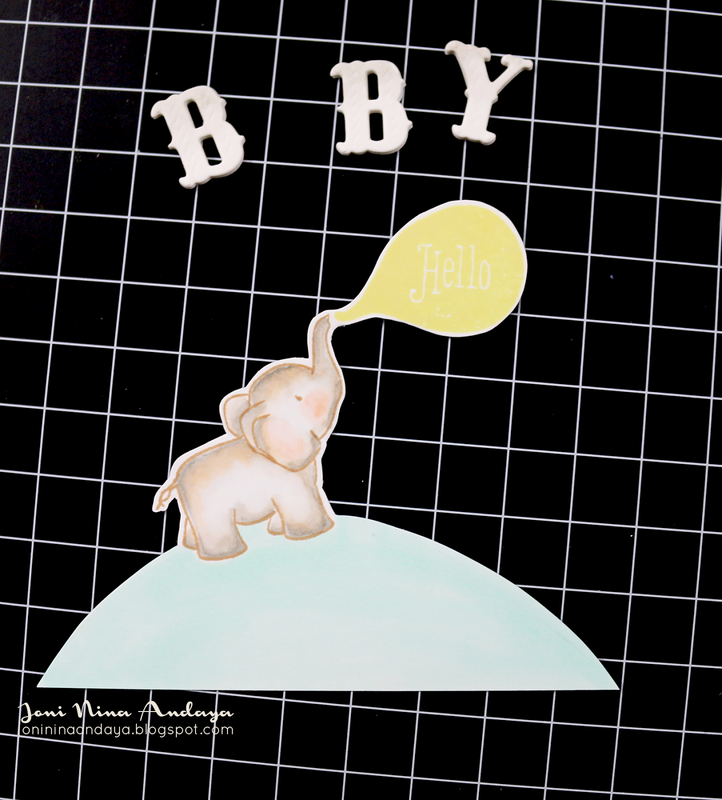 Next, I stamped the ellie and the bubble talk "hello" sentiment on the white cardstock, then colored the ellie with Copics and created the hill using my pencil. The hill was colored with Copics as well then fussy cut all together. Next, I cut a Kraft cardstock panel smaller than an A2 card and distress the bottom of the panel then adhered on the card base. Next, I adhered my fussy cut combined images and adhered with foam tape. To finish off the card I added some Pretty Pink Posh Sparkling Clear in 4mm, 6mm, and 8mm to represent as a bubble. For this next project I then again used the Bubble Talk stamp set and the upcoming Hello Trio dies. I also used the Coordinating Bubble Talk die set to cut the cut ellie. 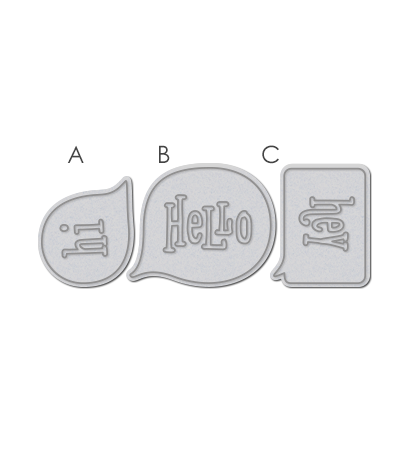 For this project I created a bubble talk for the ellie using the Hello Trio die set. To begin I cut a white cardstock panel smaller than an A2 card and stamp the sentiment "i miss you" on the bottom of the panel using the Wplus9 Coconut Husk dye ink. I then stamped the cute ellie on a watercolored paper, colored her and die-cut. The Hello Trio dies were distressed using the new upcoming Wplus9 dye ink in Falling Star (yellow), Little Piggy (peachy pink), and Beanstalk (yellow green). I adhered them with glue and added some Pretty Pink Posh Sequins. LOVE what you've been making with the new supplies--super creative and so very adorable! I adore the watercolored card!! These are simply adorable!! I LOVE your watercoloring. It looks beautiful!! I need these sets!! These cards are so ridiculously cute!!! LOVE this stamp set!! So neat that the bubbles coordinate so well with the elephants! Both of your cards are absolutely adorable!!! LOVE this little elephant, can't wait to get my hands on him ♥! Absolutely love these stamp/dies and what you've done with them! Oh my! 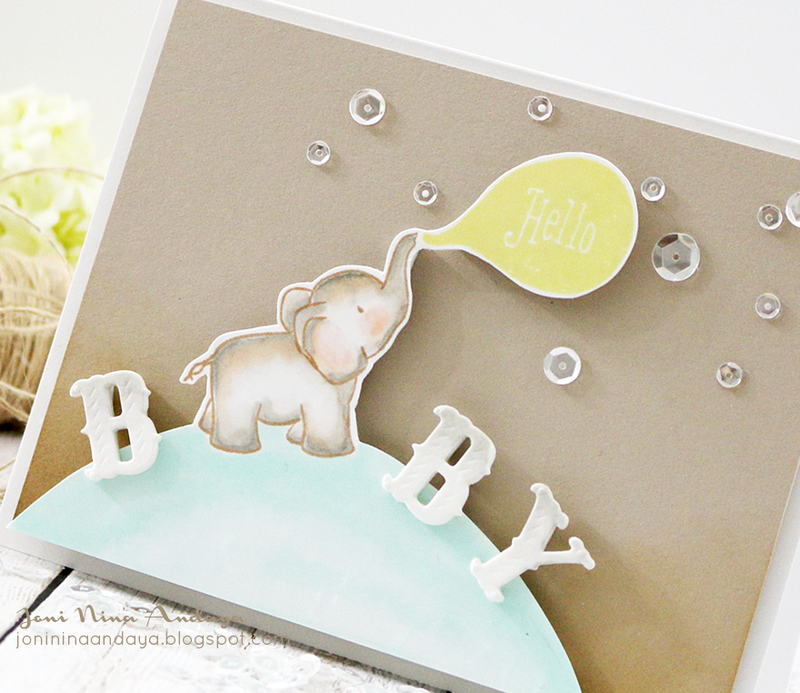 I love how you colored that adorable ellie and such sweet designs, stamping, and blending! Oh my gosh, this is so darn cute I can barely stand it. Brilliant use of that darling elephant as the "A". So sweet and cute..I am in love with your cards. Your coloring on the ellies is wonderful Joni, these are precious! Really love both your cards!! Love how you stamped the I Miss You stamp all across the bottom of your second card!! This release is awesome! too cute!!! I love your work. Your cards are super sweet! Your cards are just too cute! Love them! Sooooooooo adorable! I just love love love that elephant!!!!!!!! These little elephants are just adorable. I love your super sweet cards, such lovely designs. cute, sweet, and adorable cards! So pretty and sweet creations, adorable coloring, SUPER CUTE cards! OOohhh, yummy. Your second card confirms my suspicion that those three new colors are awesome.